Runner-up Dan Martin and third-placed Michal Kwiatkowski got theirs wrong. Both made strong efforts on the race’s steep finishing climb, the Mur de Huy, but their attacks, misjudged, fell flat, like bad punchlines. Alejandro Valverde, the race winner, got his right. The Mur de Huy is famous for being cycling’s most famous Classics hilltop finish. Its stats strike fear into the hearts of all who ride it – 1.3 kilometres long, average gradient 9.3 per cent, maximum gradient 25 per cent. It’s even worse in real life: three minutes two minutes, 41 seconds of rasping breath, stinging legs and spaghetti arms. That’s how long Valverde took to climb it, according to one estimate – a record. But it’s not steep all the way up – it flattens out (comparatively) over the last 150 metres. All attacks in cycling are not equal. The race-winner is rarely the rider who has attacked hardest, but the rider who has attacked hardest at the right, or lucky, moment. While Kwiatkowski and Martin had made their strongest efforts on the steepest part of the Mur de Huy, up the long straight out of the S-bend, Valverde made his when the gradient became visibly more shallow. The extra zip he got from attacking here was easily enough to move him clear. As the Katusha rider chased Bardet down, Valverde was in his wheel. You had to look at least six riders further back to see Kwiatkowski, and even further for Martin. Bardet was shut down just before the S-bend, Belkin’s Bauke Mollema made an attack, and Valverde simply stayed in second place. Climbing out of the two bends, Kwiatkowski moved up to the front, with Lotto’s Jelle Vanendert also making a move. Martin was in 12th place through the S-bend. Valverde slipped back to fourth behind Kwiatkowski and Vanendert, but the difference between his climb and that of his rivals is that it had been evenly paced, while everybody else was making physically expensive surges. Martin surged, to move up to the front. Kwiatkowski surged. Martin surged again. Then Valverde made his one surge, exquisitely timed. 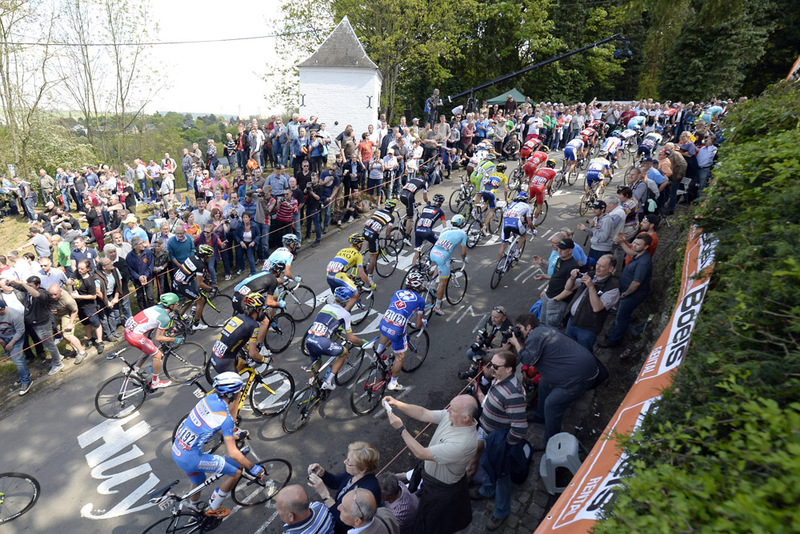 Fleche Wallonne is one of the least varied races in the WorldTour, despite the sugar-rush entertainment of the final kilometre. The outcome has been identical every year since 2004 – gruppo compatto at the bottom of the Mur, then a sprint up. And as long as there are WorldTour points on offer for winning and placing, it will never change. The Mur de Huy is spectacular, but the effect of the race is like watching a concerto consisting of John Cage’s 4’33, then Chopin’s Minute Waltz. Valverde took four hours, 36 minutes and 45 seconds to win Fleche Wallonne – you could have skipped the first four and a half hours and enjoyed the race just as much. There’s little the organisers can do about it. They could make the race harder, but there would still be a straight uphill sprint up the Mur de Huy, only from a smaller front group. Valverde won’t be complaining. And he goes into Liege-Bastogne-Liege, the second of the Ardennes Classics, with renewed confidence.